FEDMC - Cleaning Industry Health and Safety. Health and safety topics for cleaning. The cleaning industry employs large numbers of people in all sectors of the economy from offices to factories, schools to hospitals, shops to aircraft. This page provides occupational cleaning health and safety advice for people working in the cleaning industry. Key causes of accidents are slips and trips, manual handling and falls from height and the main health risks are back injuries and occupational dermatitis here is some information on the the topics. You must manage the health and safety risks in your workplace. To do this you need to think about what, in your business, might cause harm to people and decide whether you are doing enough to prevent that harm. This is known as a risk assessment. Once you have identified the risks, you need to decide how to control them and put the appropriate measures in place. A risk assessment is an important step that will help you to protect your workers and your business, as well as complying with the law. It helps you to focus on the risks that really matter in your workplace – the ones with the potential to cause real harm. In many instances, straightforward measures can readily control risks, eg ensuring spillages are cleaned up promptly so people do not slip, and cupboard drawers kept closed to ensure people do not trip. For most, that means simple, cheap and effective measures to ensure your most valuable asset – your workforce – is protected. The law does not expect you to eliminate all risk, but you are required to protect people ‘as far as reasonably practicable. Slips and trips remain the single most common cause of major injury in UK workplaces. 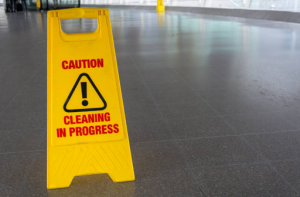 The process of cleaning can create slip and trip hazards, especially for those entering the area being cleaned, such as the cleaners. Examples include smooth floors left damp and slippery, trailing wires from a vacuum or buffing machine, which can present a trip hazard. An effective cleaning regime requires a good management system to help you identify problem areas, decide what to do, act on decisions made and check that the steps have been effective. Good communication is also needed at all levels to ensure messages are effective and the right action is taken, eg between equipment and chemical suppliers to ensure suitability of a product for the type of contaminant and floor. Effective training and supervision is essential to ensure cleaning is undertaken to the correct standard. Cleaners need to be informed of their duties and why the cleaning needs to be undertaken in a particular way or at a particular time. Lack of understanding can lead to inappropriate shortcuts. Contamination is implicated in almost all slip accidents. Regular and effective cleaning to remove contamination helps to reduce accidents. People often slip on floors that have been left wet after cleaning. Stop pedestrian access to smooth wet floors by using barriers, locking doors, or cleaning in sections. Signs and cones only warn of a hazard, they do not prevent people from entering the area. If the spill is not visible, they are usually ignored. 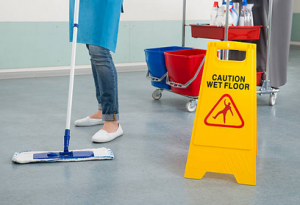 Most slips happen on wet or dirty floors. Ensure cleaning happens at the right time and is carried out in the correct manner, using the right products and equipment for the job. Ensure wet floors signs are always used. Ensure spillages are cleaned up immediately and the floor is left dry. It’s easy to trip on damaged floors so, if you spot an area of damage, highlight the damaged area, report it and where possible keep people away. Ensure cleaners use electrical sockets nearest to where they are working to reduce the risk of tripping. You must assess the risks to your employees of developing contact-related dermatitis. Where there is a risk, you must provide adequate control measures, information, instruction and training. Work-related contact dermatitis is a skin disease caused by work. It is often called eczema and develops when the skin is damaged. This leads to redness, itching, swelling, blistering, flaking and cracking. The most susceptible parts of the body are the hands, followed by the forearms and face. It can be severe enough to keep you off work or even force you to change jobs. Avoid contact with cleaning products, food and water where possible, eg use a dishwasher rather than washing up by hand, use utensils rather than hands to handle food. Protect your skin. Where you can, wear gloves when working with substances that can cause dermatitis and moisturise your hands to replenish the skin’s natural oils. It will help you to understand what you need to do to comply with the Control of Substances Hazardous to Health (COSHH) Regulations 2002 (as amended), which applies to the way you work with these substances. Employers have a legal duty to manage the risk of musculoskeletal disorders that their workers may be exposed to. Before anyone can start to control the risks in the workplace they need to know what they are, how serious they are and who is exposed to them. The first step to managing risks is by carrying out a risk assessment. This should be carried out to decide if there are enough precautions in place or if more needs to be done to prevent harm. This assessment should also consider the main risk factors, such as manual handing, awkward postures, work organisation and hand/arm vibration. Manual handling activities should be avoided if it is reasonably practicable. If not reasonably practicable, employers should assess the risk from the activity and implement effective control measures. In practice, employers have found that initiatives for reducing musculoskeletal problems in the workplace are most successful if they involve employees and their representatives working together on risk assessment and investigating accidents. Why are cleaners at risk? Cleaning work is demanding and labour intensive. Changes within the industry means that cleaners increasingly work under time constraints. Many tasks involve heavy manual work, putting strain on the heart, muscles and other tissues. There are many examples within the cleaning industry of accidents involving working at height, for example: whilst working on stepladders, over stretching from ladders whilst window cleaning, standing on benches or chairs to clean high surfaces. With a little planning and by using competent people (who have the right experience and training) and the right equipment, these accidents could have been avoided.